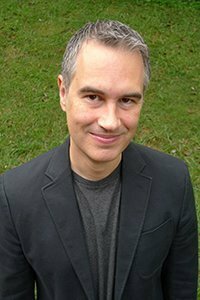 Kevin Hall, the senior NIH researcher recently published a paper in AJCN that has received a lot of media attention. This study, he claims, completely refutes the insulin hypothesis so completely that it is now ‘dead’. That’s interesting, I thought, as I sat down to read the article. It was a little surprising, therefore to read this paper and realize that Hall’s conclusions were entirely his own opinion. He suffers so badly from confirmation bias that he may as well have written “My mind is already made up regarding the insulin hypothesis. Please do not confuse me with facts”. Confirmation bias is a well-known psychological phenomenon whereby facts that agree with your pre-formed opinion are accepted as true and those that are not, ignored. All facts become filtered through this bias to confirm your previously held opinion. It’s also known as a closed mind. This happens far more frequently than is often realized or admitted. A similar situation exists in the research behind the weight losing effect of breakfast. 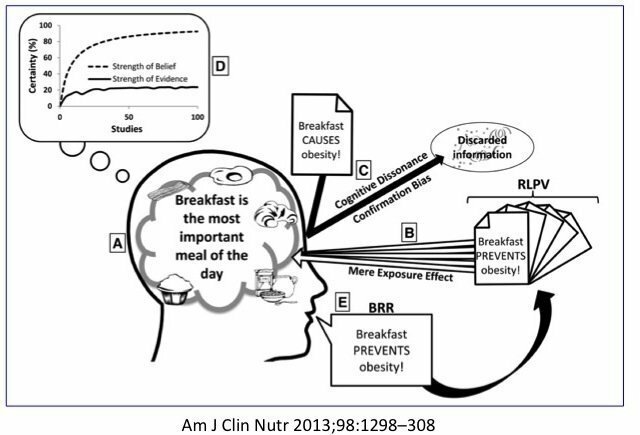 Researchers used this question of the proposed effect of breakfast on obesity (PEBO) to look at how researchers consistently interpret results depending upon their beliefs. If you believed breakfast made you lose weight, then studies were interpreted to support this view even if it did not. Two specific tactics are used – Research lacking Probative Value (RLPV)(association data that can’t prove anything) and biased research reporting (BRR). As more and more people believe something to be true, the effect becomes worse since all research is now interpreted to fit the preconceived facts. Starting with the preconceived notion of ‘A’, all research is interpreted to support this belief (B), and all negative studies are ignored (C). This only reinforces the belief (D) which then leads to biased research reporting. This, of course, is a vicious cycle. The same effect is obvious in the Calories In, Calories Out (CICO) diehards. So, let’s take a closer look at this paper and its claims. The paper is titled “Energy expenditure and body composition changes after an isocaloric ketogenic diet in overweight and obese men“. Let me give you some background. The award winning science journalist Gary Taubes believes that obesity is essentially a disease of too much insulin – hyperinsulinemia. Since refined carbohydrates stimulate insulin more than fat or protein, reducing said carbs will result in greater fat loss. He set up the non profit organization NuSi to raise money to fund research and this paper is the first one published. 17 overweight men were admitted to a metabolic ward where all the food they ate were carefully measured. There was a 4 week run-in phase to establish a baseline where men would eat a high carbohydrate, high sugar diet and then switched to a carefully designed low carbohydrate, low sugar diet. Various measurements were then taken, including energy expenditure (EE – how many calories the body is burning), over the next 4 weeks. The basic question is this – does a ketogenic diet (KD) cause fat loss? Here’s the result. Over the 4 week KD, yes there was fat loss. There was an initial period of greater weight loss which all agree may be some diuresis. We can also agree that insulin levels were brought down by the KD. Secondly, using measures of EE there was an increase in calories burnt. Those are all facts, not opinions, derived straight from the study. Isn’t that a good result? Well, if you’re Kevin Hall, no. You need to find a way to spin this in a negative way. Then you can tell all your friends in the media so you can declare ‘I was right’. Let’s see how this was done. When patients embarked on their run in phase, they were switched to a 2700 calorie/day high sugar high carb diet, meant to replicate the Standard American Diet (SAD) that caused the obesity epidemic. Nobody actually believes that this is a healthy diet, and nobody believes it should cause fat loss. But it did. Why? Anybody who has done research knows why. It’s the effect of going into a study and knowing that people are testing you. It’s a universal effect. That’s the precise reason why we have run-in phases. To establish a proper study baseline when people know they are being watched. Let’s take an analogous situation. Suppose we are teaching math. We teach a semester with no tests, no exams, no checking of homework and no projects. Students are just supposed to spend 1 hour in class and 1 hour of homework a day. They all say they do it. Then, unbeknownst to them, we test them on a standardized test. They do really bad and score 65%. This is the same effect we see when people enter a study. No matter what we are measuring, things improve simply by entering a study. It happens with blood pressure, blood sugars, cholesterol, diets, depression – everything. But the results do not get better indefinitely. It’s a one time benefit. Students score might improve from 65 to 80 in one semester. This does not mean that another semester of testing will raise their scores to 95. Instead they will likely stay at 80. But this is exactly what Hall does – he assumes that this one-time benefit will persist indefinitely. According the Halls assumption, you should therefore simply continue eating the SAD with 25% sugar and expect to lose weight indefinitely. Go ahead. See what happens. I already know. So do you. You’ll get fat, you’ll get type 2 diabetes, and then eventually, I’ll put you on dialysis and chop off your feet when they go gangrenous. But at least Hall can say that he was right. The second major issue is regarding EE. When you switch from the baseline diet to the KD, the number of calories stays the same. If it causes continued weight loss, then you might expect to see an increase in EE in order for the body to lose weight. This is called a metabolic advantage. Surprise, surprise – that’s exactly what happened. So how can you spin this one? With language. Look at how Hall describes the absolutely critical increase in EE. Here’s what he writes “the KD coincided with increased EEchamber (57 ± 13 kcal/d, P = 0.0004) and SEE (89 ± 14 kcal/d, P < 0.0001)” (emphasis mine). Hall is telling you that this was merely a coincidence that patients are all burning an extra 57 calories per day. WTF??? There is nothing coincidental about it. You switched them to a KD. EE increased. The P value of 0.0004 means that there is a 99.96% chance that this is NOT COINCIDENCE. Hall knows this as well as I do. This is basic statistics 101. Hall, a mathematician is surely aware of this. So EE increased and yes, the effect waned over time. What did he expect? That things would continue indefinitely in a straight line? Life doesn’t work that way. Hall had assumed this would happen for fat loss during the SAD, but then correctly points out that EE does not. If doesn’t in either case, dude. Get a clue. The reason why EE is so critically important is that this is the key to lasting weight loss. Hall had just been profiled in the New York Times cover page measuring the EE of Biggest Loser Contestants. The reason they all regained their weight was that their EE slowed to such a degree that caloric reduction could not keep up. 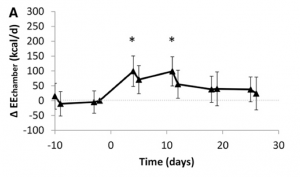 So, an intervention like a ketogenic diet that increases EE is HUGE, GREAT NEWS. Except, of course if you’re Kevin Hall, because it means you were wrong. And you care more about your reputation than people’s health and well-being. Dr. David Ludwig, a researcher from a little place called Harvard had shown exactly this same thing in his study from 2012. This study also tested for difference in energy expenditure following different dietary strategies. Once again, as Hall had shown, the EE is best with a very low carbohydrate diet. So Halls study merely confirmed what had already been known. I’ve highlighted what is fact. I’ve crossed out what is pure spin. 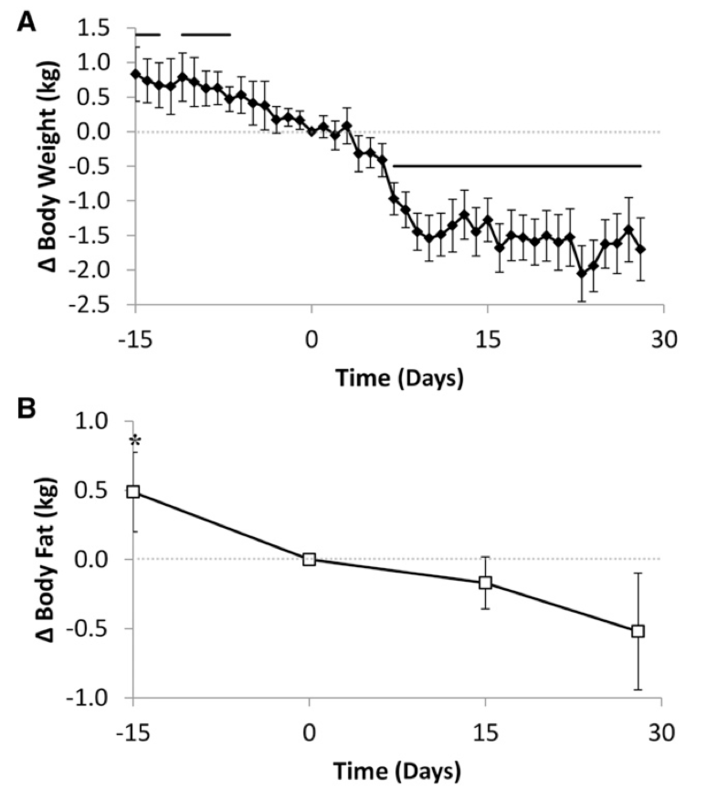 Did the KD cause body fat loss? Yes it did. And that’s really, really important. Hall spins it this positive into a negative by moving the goalposts – “Oh but it didn’t do better than before. People eating a 25% sugar diet will continue to lose fat indefinitely at the same rate”. Umm… What planet are you from, Kevin Hall? Then he says the increase in EE is “relatively small’. So what? Did it increase or not? In fact, your own study from the Biggest Loser suggests that weight loss from constant calorie reduction will DECREASE EE, so even the stabilization (let alone the increase) of EE is critically important. That’s the gold medal, buddy! You just threw it in the garbage. Unfortunately, spin-doctor Hall is now entering a logic free zone, and many journalists like Julia Belluz and other bloggers are happy to take what is shared at face value. 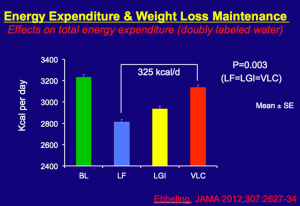 “In this first Biggest Loser study, I demonstrate why stable EE is the most critical factor for weight loss. In this second study I’ll show how stable EE is absolutely worthless. Ta Da!” Hall wants desperately to save his own reputation, even if he has to sacrifice your health to do so. Sad. So sad. The facts alone, without any spin would be this. A ketogenic diet, independent of calories causes fat loss and causes an increase (or at least the stabilization) in EE. That’s the facts. And I love it. Because I can use these fact to help heal patients and save lives. Luckily, I can see Clueless Kevin Hall’s blatantly biased reporting for what it is – the final gasp of the dying paradigm that all calories are equal. I’m curious what Taubes and Attia have to say to hall about this. Pretty sad for them, that couldn’t have been a cheap study and they chose him to run it. Attia is no longer involved with NUSI, for reasons that are not clear and have not been provided. I personally think that’s a travesty. Someone should say why he’s no longer there. Seems obvious, when looking at Hall’s spin and the fact that he got away with it. I have seen his ridiculous conclusions debunked multiple times now. If I was Attia and at the Helm of NUSI and my researchers would be allowed to spew this kind of nonsense – and get away with it – I would also throw the towel. Pure speculation though. I was really disappointed when I saw how much money Attia got in 2015 from NUSI, which is (supposed to be) a non-profit organization. Over $700.000! Okay, and this is important because…? Did you send him cash or check? The whole industry (of funded research) is a fraud. And to add insult to injury they will protect their golden thesis above all else. Read the paper, absorb the data and draw your own conclusions. It clearly shows that the iso-caloric, iso-protein diet cause less fat loss, and a tiny energy expenditure increase. The only “golden thesis” is that keto-diet causes more fat loss than alternatives. Never mind the real actual results of the test. Or is it just too hard for Dr. Fung to face the results of the study? why cling to a mere use of a single word, as a reason to condemn the whole study? and why pick one single point in time, instead of looking at the trend line? I love Dr Fung’s passion and attitude in this post! He’s CORRECT and FEARLESS! It’s obvious he is attacking Kevin Hall’s ridiculous (yes, meaning ‘worthy of ridicule’) conclusions, based on KH’s own scientific findings, and NOT KH’s personality or methods. The victimization that you perceive is on you, not him. Scientific truth doesn’t care about your feelings, or anyone’s. I’m truly sorry for the loss of your mother at such a young age. Fortunately in this ‘age of the internet’ we are able to seek our own solutions, and the dogma and vested interests in the advice of the last 50 years no longer has a monopoly. Too late for your Mum, but there is now hope for the future! I was going to write a similar post as Phyllis Collins, but I will just affirm many of her comments regarding this blog posting. Dr Fung your work and writing has been an immeasurable help to me in losing weight. However, I felt the tone of this article was unhelpful in establishing your argument. This blog post is being shared widely on the internet and I think a more professional rhetoric would have made a more positive impact. Diabetes can be reversed with a high carb or low carb diet. This has been proven over and over again. See Walter Kempner’s studies. Spinning mind-independent facts contrarywise in abstracts is unfortunately not uncommon in studies. Researchers know journalists and laymen are lazy and ignorant. Well said Danielle. I’m glad Dr. Fung says it like it is. Thank you for such a good post in support of Dr. Fung. And this folks, coming from a retired nurse. I’m with you Debra. Job well done Dr. Fung! I agree, Dr. Fung’s tone was one of attack and ridicule. However, I do not find this to be very remote from his usual tone. A mild-mannered, polite doc would not manage to get his against-dietary-recommendations message across. 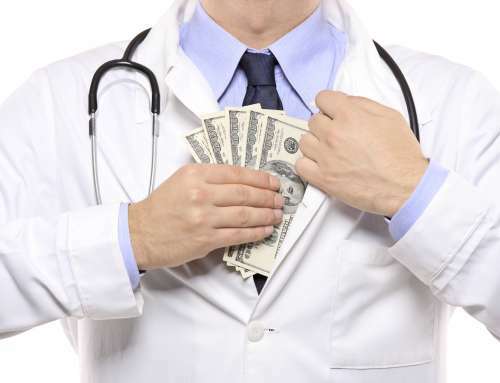 For those of us who owe Dr. Fung gratitude, he could not have done it without a belligerent attitude. Cheers. With half-assed attitude like yours, millions of diabetic in the world will continue to suffer and die. Cowards like you are directly responsible for this disaster. You should be ashamed, you protect the $y$tem. It is not anger but passion. One is from hatred, the other is from love. Dr. Fung has always been witty and hip. This is nothing too new from his rhetoric. Is it effective for the laypersons? Yes I believe it is. Is it wholly professional? No, but this is not a comment in a scientific journal, there is no need to be. It’s a different medium, it calls for different rhetoric. For a blog post, this is fine. They labeled the low carb diet as KD (ketogenic diet) but they made no attempt to verify if the people were in ketosis, and the period of time they were on the low carb diet was very short, they probably were never in ketosis. It did seem that the total number of grams of carbs were too high. I believe the full published paper does show blood ketone levels at about 0.8 mmol/l from memory. The study was supposed to be isocaloric and eucaloric so there should have been no ongoing weight loss by the end of the run-in phase. Personally I think any ketogenic study needs to start after at least 2 weeks on Atkins Induction or similar to at least get “in the zone” otherwise we’re doing science in an unstable transitional state which is seldom good when trying to understand long term effects. I checked and you are spot on ! The abstract says that the diet was reduced by approx. 300 kcal per day, or 10%. The result states marginally increased energy expenditure, absolute minimum absence of reduction also by Kevin Hall’s report, which as you point out is the complete opposite to a standard calorie reduced diet. Thanks! It means the insulin hypothesis is a step closer to be fully proven. For full proof a longer study including control group. Surprised they did not have a low fat control group. Just splitting this group in half would have told more than now, guess at same cost. Since reduced calorie ketogenic diet does not reduce EE but reduced calorie SAD or low fat diet reduces EE, the missing comparison study is obvious and would end the debacle, since opposite EE trends hardly can be explained away. Yes, David, study is weak, but it is still important to acknowledge that Hall’s interpretation of it is off, to say the least. Jerome, Hall did not set up NuSi. Those who did made a big mistake dealing with him. Dr Fung, your reliance on the idea that people magically do better when tested worries me a bit. This was a metabolic ward study afterall. Can you help me out? ever heard of the placebo effect? We’ve found people become stronger, faster, healthier, and overall better at everything once they are part of a study. We’ve even had disease symptoms disappear just by putting people in studies. It’s very powerful, which is why most studies have a control group. It’s a known scientific fact that once you observe something, what you are observing will change from baseline. I think anytime you are watched at anything, you’ll be better that that thing. This is particularly true in nutrition, especially for things like food diaries. If you have someone weigh all their food, you’ll get a much better sense of intake then if they write a food diary (where they’ll conveniently “forget” they ate that evil hamburger with its saturated fat). Well said, Jason. This is exactly what we’ve been saying when asked about this study. It is not necessary to evaluate Hall’s study. The list of studies from your Youtube, I think called Etiology of Obesity, shows direct link between insulin and weight gain. I think it would be good to lay out the details of those studies. If you send me the direct links or better, the pdf’s of the papers, I will do it (I wish I hadn’t said that). @Richard David Feinman wow good on you what an offer! Taubes allowed the fox to guard the hen house be he wanted a researcher who didn’t believe the insulin hypothesis. If you did look at the study, change from the SAD to ketogenic diet also resulted in the greatest decrease in triglycerides. Hi Jason do you know that, bros write blogs .Why don’t you go ahead and comment in the paper? It takes courage, isn’t it?Good luck and looking forward to some actual discussion and coming up with a solution rather than blogging . Hope you don’t censor this comment. So Dr. Fung doesn’t come up with solutions? Are you reading the same blog as I am? They don’t have to do expensive studies and trials to prove that low carb works(proving the low insulin theory is very much alive and well). All they have to do is cou t us hundreds of thousands of older people who spent decades on the CRAP or cico or SAD methods of eating and stayed fat, who are now called SKINNY at family functions after a year of LC and IF. Check post above by Jerome Benthamite ! If still not sure, check that your fasting insulin is well below 5 ! What points would you like clarification on? I have normal weight (23 BMI) and wonder if I ever became insulin resistant and adopted the fasting and LCHF protocols, wouldn’t I become too skinny? No because excess dietary fat is stored in adipose tissue. Low carbs followers usually starts out misinformed ,pigs out and develops IR and then preaches low carb.Lift weight ,would you?I have never gained so much fat to loose.Guess what I am more informed than most of IR guys on low carb. Sten, a very important fact I failed to mention. In my last, likely over 8 weeks, there have been, with very rare exception (1/2 slice cheese cake 50% fat 50% carbs) there have been NO sugars and no refined carbs. The cheese cakes have to go, at least if you get through my reply above…. But not on all days you don’t fast although don’t treat yourself the days just before next fast, clear from above too. 🙂 That was a birthday thing coupled with having lost over 100lbs over the course of the prior 11 months. That was my ‘brass ring”. Is grey sea salt a different animal than normal sea salt? I mean aside from it being ‘collected by hand using traditional Celtic methods and wooden tools’? Isn’t it just NaCl plus minerals? So, I know this comment thread is from months ago, but I’m wondering if you ever got your answer Walt. You appear to have been a very similar trajectory to me, but only about 5-6 months ahead and I wondered if you figured things out. I’m pretty sure I’ve figured them out for myself, but time will be the ultimate arbiter of that in the end. I figure you probably ended up landing somewhere similar to myself, but was curious. In regards to increasing metabolism, I meant when you have reached your target or are ready to take a break from loosing weight (ie stop being calorie negative). Then you can try experimenting with excess calories combined with LCHF and IF to control fat gain and increase EE. Concentrated ketones can also be a sign you aren’t drinking enough water. Dr Fung says FBS frequently goes down to the 50’s during multiday fasting. I believe ketones replace some of the glucose in the blood. You are probably good as long as you are feeling fine, in ketosis, and not on any medication that affects blood sugar. Walt- Are you reading labels? I bet there is corn syrup in the hormel product. Its in everything nowadays. Corn syrup is the only thing that shoots my sugar up to 200. Bad stuff..
Hi Seebrina, nope. 0 carbs, 0 sugars, only fat and protein. Awesome critique Jason. Best I’ve read. Well done. Keep up the good work. You’re smarter than most scientists. Why do you assume from the evidence in this study the SAD diet weight loss would stop or slow, but weight loss on the isocaloric KD would continue? Look forward to seeing you speak this weekend in San Diego. I recommend you to practice reading and writing more English so you can see and comment on what we already have written here. Swedish does not fit in here, really. Cheers! Dr. Fung, I am essentially in agreement with you on this. I have one question, though. By what mechanism or process would the participants lose weight initially on the SAD? I mean, with the math course analogy, it’s how much homework and study, etc. being consciously done. 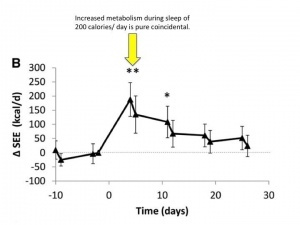 Regarding the Initial SAD consumption in this experiment, do you mean that the initial 2700 calories they consumed was possibly fewer calories than they typically consumed before the experiment began, resulting in the initial weight loss? Or that they actually consumed fewer than the 2700 calories they were assigned to eat? The typical diet was 3,000 calories, 10% reduction. Link to study is above. Also see my comment about pre-study snacks never accounted for just above here, and the important comment by Jason July 21 above. It takes time for a liver full of sugar and fat to become “normal”. High insulin can give low FBG while a little lower insulin can give very FBG and normalized insulin and insulin sensitivity eventually gives good FBG. Read his article carefully! Wow, thank you so much Sten! And I have posed this question to Dr. Fung but certainly understand he is unable to answer every question. And yes, so happy that her fasting insulin is so very, very low!! She is having a hard time finding a doctor who is willing to do all the tests that she wants, when she wants them! 🙁 I believe all that you have said is what I am thinking, it’s nice to see you’re in agreement with me. LOL . I surely appreciate your response. CHEERS! Thank you Valerie! All of that makes sense! I’ll take a look at Bill Lagakos…. thank you so much for your good advise! I should clarify. I do not test fbg in the morning, I test it before, what would otherwise be, supper. Consequently, what happens when I am asleep is not a factor here, plus it talks about rising fbs. Sorry, next A1C should tell the tale, NIDDM wise. Walt, Jason Fung is the master! Your full body heat will return I am sure! Thanks for your good example of 2:5 , this other way! Someone, I think it was either Ann or Valerie, asked me to post my last A1C results that I was preparing myself for being higher than I wanted. It was 5.6. FBG was 69, considered low. By the end of the day when I tested it here, it was 78, normal. I am aiming for my next A1C in Oct, to be in the 4’s. They didn’t test, Cholesterol or triglycerides, which strikes me as odd. Walt- Have you considered your circulation? Not sure you mentioned your activites but I sit at a desk to work and am cold. As soon as I do a few laps Iam much warmer. Sten, measured fbg this afternoon, 78. So I am am feeling feeling better about any precipitous drop. Hi Walt, I am guessing here: if you ate enough fat during Thu-Fri, you might stay in ketosis. If so, maybe your body will adapt to fasting without the ups and downs. Thanks for your posts, and I am looking forward to my Walt-inspired fasts, starting tomorrow. Keep hammering them Dr. Fung, I am as angry as you are about the perversion of science for political ends. People are dying. People are losing limbs and it is because people like Dr. Hall are given a pass by the polite people. If no one calls out the misinterpretation and misrepresentation of scientific studies, then the funding for expanded studies of these results will not be available. The forked tongue interpretation of results leads to a fork in the road by which the lemmings will follow each other off a nutritional cliff. Ancel Keys, much? Dr. Fung, I think you were too nice. We trust researchers to check their personal biases when doing science. We trust them with our lives. Look at the results in light of DR PANDAS WORK on time restricted feeding. Many people eat 15 or.more hours a day. Fewer eat 12 hours and few eat 9 and fewer still restrict eating to 5 or 6 hours. So in the artificial lab time restrictions of Halls study maybe the Time restrictions are the driving factor. Increased EE for a little over a week and then back to baseline… that’s not going to do anything long term. The benefits of keto has nothing to do with increased EE. The end. Can you or we do better? Yes, call it intermittent fasting or time restricted feeding! Use to Salk institute app from doctor Panda and collectively create your own study of one. Or many. You know what would be interesting? Do a 4 week run in phase on a strict keto diet, then an actual experiment with the standard American diet. I have a hypothesis at what the results would be and wonder how Kevin Hall could spin that? I am looking forward to more on fasting time restrictions and macro nutrient research. Maybe restricted feeding research will show 8 hours on SAD junk food is better than 15 hours of keto or vegan or palio? Maybe 8 hour feeding blunts differences in macro nutrient? Hall has done nothing wrong. He designed and carried out a study, analyzed the data and presented his conclusions. The next step, those that disagree with him can do their own study. In physiology the data suggests a calorie is a calorie regardless of the source. Whoever, disproves this will be famous. If you want to show Hall is wrong do the research and publish the results.